Right now China’s crackdown on corruption is bringing in truckloads of confiscated gold, artworks and other treasure. It’s a system that encourages corruption at the highest levels of power and concentrates all the wealth into the hands of the ‘Power Elites’ of the Chinese communist party (CCP). Now when it’s needed those corrupt officials can (and are) be rounded up, sent to trial for corruption (mainly) then jailed/executed accordingly and all their illegal property and treasure put back in the coffers. Not that the ordinary joe will see any of it, but it might help the economy and keep people in jobs. One can’t overlook the huge profits made from live organ harvesting and other criminal activities carried out by the communist party at various levels. China has reported annual growth rates since the panic of 2008 of between 6.7% and 12.2%, with a steady downward trend since early 2010. 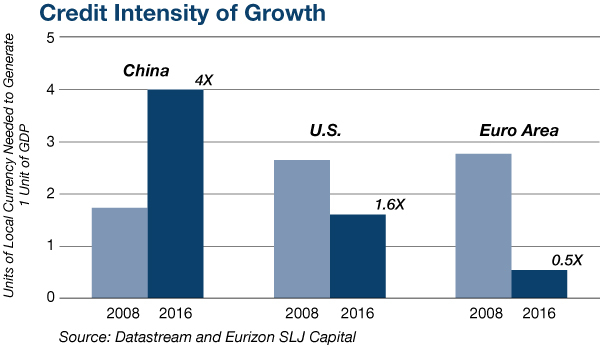 If China’s growth engine is running out of steam, as I’ve described, how has China managed to maintain such relatively high growth rates? The answer is contained in three key words: debt, deflation and waste. Waste is a blunt word referring to non-productive investment. The investment component of China’s GDP is about 45% of the total. Most major economies show about 25% to 35% for investment. But at least half the Chinese investment is wasted. It goes to projects that will never produce an adequate return, either on an absolute basis or relative to alternative uses of the funds. Click here to learn how you can follow the money. If this wasted investment is subtracted from GDP, similar to a one-time write off under general accounting principles, then 8% growth would be 6.2%, and 6% growth would be 4.7%. There are other distortions in Chinese growth figures, but wasted investment is one of the most glaring. A simple example will make the point. During a recent visit to China I took the high-speed train from Beijing to Nanjing and passed through the magnificent new Nanjing South train station. The train had the smoothest, quietest ride I’ve ever experienced even at speeds of 305 kph. The noisy clickity-clack of Amtrak’s Acela service from New York to Washington seems like a Wells Fargo stagecoach ride through the Old West compared to the Chinese railroad. The train station was over a quarter-mile from one entrance to the other side, and had marble floors, high ceilings, expensive boutiques and over 128 escalators that all functioned perfectly. There’s only one problem. My ticket cost about $30. Tickets on Amtrak for a ride of similar duration cost about $250, and Amtrak loses money. There’s no way China can pay the costs of building and operating its railroad system with such inexpensive tickets. But the Nanjing South train station project did create 20,000 construction jobs for over two years. That really is the point. China needs to find jobs for the millions of worker arriving from the countryside looking for work. Failure to generate those jobs could result in social instability, riots, and attacks on the legitimacy of the ruling Communist Party of China. As a result, China borrows the equivalent of billions of dollars to finance white elephant and prestige projects that create jobs with little thought given to how the debt will be repaid. This brings us to the next element in China’s non-sustainable growth formula — debt. Any economy can produce short-term growth by incurring debt and using the proceeds as government spending, tax cuts, investment, or grants. This is nothing more than the classic Keynesian fiscal stimulus with its mystical “multiplier” effect that produces more than $1.00 in aggregate demand for every $1.00 borrowed and spent. In fact, there’s ample evidence that the Keynesian multiplier only exists when an economy is in recession or the very early stages of an expansion, and when its debt levels are relatively low and sustainable. Highly indebted economies in the late stages of an expansion do not conform to Keynes’ theory of a multiplier. Unfortunately for China, it is both highly indebted and has not suffered a recession for eight years. China should therefore expect the GDP multiplier on new debt used for spending or infrastructure to be less than 1. That is exactly what the data shows. The chart below measures credit intensity defined as the number of units of local currency needed to produce one unit of growth. The local currency metric is a measured by central bank money printing to monetize debt, and is therefore a proxy for the debt itself. The chart shows that in China today, it takes $4.00 of money printing to produce $1.00 of growth. This is up significantly from 2008 when it took $1.70 of money printing to produce $1.00 of growth. This shows that the Keynesian multiplier is less than 1, in fact it’s 0.25 in China today. (Only Europe shows a true multiplier where less than one unit of new money can produce a unit of growth). The chart also shows that China’s situation is growing worse. It takes more and more debt to produce less and less growth. This is a non-sustainable dynamic that can only end in a debt crisis, a recession, or both. China and the U.S. China are in the worst position, where 4 units of debt are needed to create 1 until of growth. This suggests a debt “death spiral” ending in a credit crisis, recession, or both. China is now trapped in a debt death spiral. It cannot afford for growth to slow because that would cause unemployment, bankruptcies, and social unrest. But, it cannot continue growing without massive borrowing and spending programs. This debt problem points to the third element in China’s growth formula, which is deflation. Persistent deflation and disinflation is caused globally by a combination of demographics, debt, deleveraging, and technology. China is ground zero for global deflation because of its cost structure and its cheap currency that exports deflation to trading partners. Real growth is calculated as nominal growth minus inflation. A simple example would be an economy with 5% nominal growth and 2% inflation. The real growth would be 3%, (5 – 2 = 3). Deflation is really “negative inflation.” In converting from nominal to real growth, you are subtracting a negative, which is like adding. For example, an economy with 1% nominal growth and 2% deflation, would have 3% real growth, (1 – (-2) = 3). This “growth through deflation” dynamic has been playing out in China is recent years. This can produce higher real growth, but it does so with lower nominal growth. The problem is that debt repayments are nominal. While real growth can be strong in a deflationary period (like in the U.S. in the 1870s), the lack of nominal growth makes it harder to pay off nominal debt. Deflation makes the real value of debt go up, which compounds an already dangerous debt situation. On the earlier visit to Nanjing, I met with provincial Communist Party officials who took me on a tour of a massive multi-city construction project with office parks, skyscrapers, apartment buildings, hotels, recreational facilities and transportation links for each of the cities. It was all empty. This blind faith in Beijing’s ability to bail out every bad debt in the world’s second largest economy raises the question of Beijing’s willingness and ability to do so. Higher interest rates will ultimately bankrupt Chinese companies and lead to higher unemployment and slower growth. Look for the Chinese banking system to weaken. In less than six months, the yuan could finally undergo a maxi-devaluation. The post The Chinese Economic “Death Spiral” appeared first on Daily Reckoning. This is a syndicated repost courtesy of The Daily Reckoning. To view original, click here. Reposted with permission. Wall Street Examiner Disclaimer: The Wall Street Examiner reposts third party content with the permission of the publisher. I curate these posts on the basis of whether they represent an interesting and logical point of view, that may or may not agree with my own views. Some of the content includes the original publisher’s promotional messages. In some cases promotional consideration is paid on a contingent basis, when paid subscriptions result. The opinions expressed in these reposts are not those of the Wall Street Examiner or Lee Adler and no endorsement of the content so provided is either expressed or implied by our posting the content. The Wall Street Examiner makes no endorsement or recommendation regarding them. Do your own due diligence when considering the offerings of third party providers.